Venezuelan doctors have come under pressure from President Nicolas Maduro’s government for trying to alert a visiting UN mission about the severe lack of hospital medicine and equipment, NGOs say. “They forcibly booted out the head of a medical school in Maracay (west of Caracas) and since then we haven’t heard from her,” said Jaime Lorenzo, executive director of one association called Medicos Unidos (Doctors United). “She protested against the repression of medical staff,” he said. On Sunday a clash erupted when a pro-regime crowd threw stones at hospital staff in the northwest city of Barquisimeto as they waited for the arrival of representatives of the UN High Commissioner of Human Rights. According to Medicos Unidos, the repression has worsened over the past two weeks. “We have drawn attention to our patients dying for lack of supplies and equipment. Doctors have been arrested without any reason at all,” Lorenzo said. “Now I have to flee like a criminal and my mother is crying over it,” he wrote. “They want to deprive me of liberty. My only crime is wanting to raise the alarm over the precarious situation in Carabobo’s hospitals,” he said. The visiting five-member UN team has declined all contact with media. It is officially in the country on a “preliminary technical mission” to prepare for a possible visit by the High Commissioner for Human Rights, former Chilean president Michelle Bachelet, who was formally invited by Maduro’s government in November. “I told them that patients we operated on can’t get chemotherapy here and those unable to buy it abroad die. And when I told them how much we earn, their jaws dropped,” she told AFP on condition of anonymity. In crisis-hit Venezuela, a doctor earns between 18,000 and 30,000 bolivars per month — the equivalent of $6 to $10. “In Valencia (in Carabobo state) and Barquisimeto we saw two trucks delivering medicine and equipment to hospitals the mission was going to visit,” Lorenzo said. 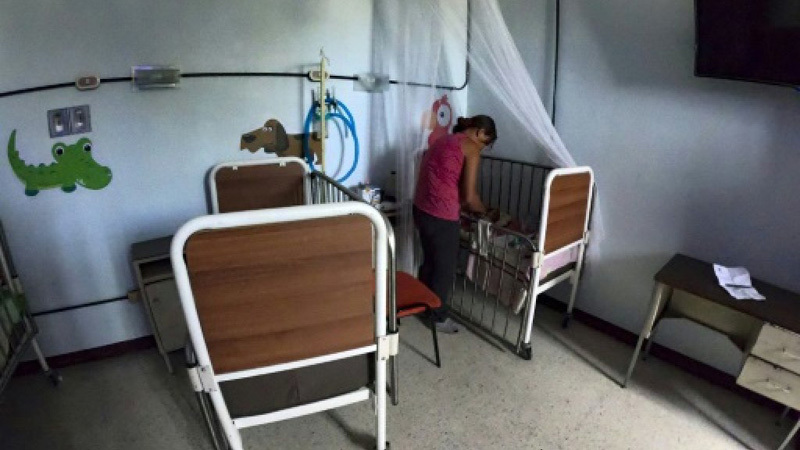 In Venezuela’s public hospitals, 90 percent of medical items are missing and nearly all the state laboratories are closed, according to a survey by another NGO, Doctors for Health, with the opposition-ruled National Assembly. Maduro’s government has released no official figures on the state of public hospitals for three years. According to the UN, 3.4 million Venezuelans have abandoned their country, with more than three-quarters of them — 2.7 million — leaving since 2015. Matters were made worse when a weeklong, nationwide blackout early this month paralyzed the country and knocked out power to hospitals, many of which did not have working generators.